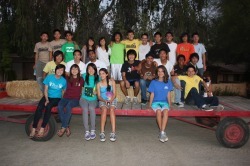 The Cerritos Cross Country & Distance Track and Field team is comprised of over one hundred athletes (140+ Cross Country; 90+ Distance Track & Field) of dedicated athletes of all ability levels. The goal at Cerritos is to develop amazing individuals rather than simply great athletes, as the success of the athlete beyond their years in the program is key to a successful program. In addition, the idea of ohana is one of the most important aspects of the team as the unity of the program is the team's greatest success and the reason whey so many athletes come to join our program. For more information, please browse our site. Please note that some areas require a password which can be obtain from Coach Watanabe for athletes, parents and coaches only. We welcome you to our home! Last Updated 3/9/2010 at 8:32pm.